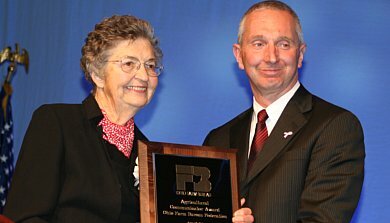 COLUMBUS — The Ohio Farm Bureau Federation presented its highest honor, the Distinguished Service Award, to Farm Bureau volunteer Lois Boyer and U.S. Sen. George Voinovich. The awards were presented Dec. 2 during the group’s annual meeting in Columbus. Wade Leaman received the Cooperative Agriculture Educator Award, and Ruth McLaughlin received the Agricultural Communicator Award. Lois Boyer was president of the Farm Bureau women’s committee in Greene and Clinton counties, president of the southwest women’s committee, president of Clinton County Farm Bureau and served on the Ohio Farm Bureau board of trustees from 1985 to 1995. Boyer also served as a 4-H and OSU extension volunteer for 60 years, and served eight years on the state 4-H advisory committee. She also served on the governor’s committee on recycling and litter and the governor’s women in traffic safety committee. She has received numerous recognition for her efforts including the state 4-H alumni award, and was inducted in the Ohio 4-Hall of Fame in 1985. She and her late husband, Keith, were dairy farmers for 45 years. U.S. Sen. George Voinovich was unable to attend the Columbus event, but thanked the farm group in a videotaped message. He is being honored for a lifetime of public service. Voinovich was a member of the Ohio House from 1967 to 1971, Cuyahoga County auditor from 1971 to 1976, Cuyahoga County commissioner from 1977 to 1978, Ohio’s lieutenant governor in 1979 and mayor of Cleveland from 1979 to 1989. He became governor in 1990, serving in that role for two terms. In 1998, Voinovich was chosen to represent Ohio as U.S. Senator, and still holds the office until his retirement at the end of his current term. PHOTO ABOVE: Wade Leaman, retired general manager of the Western Reserve Farm Cooperative, received the Cooperative Agriculture Educator award from the Ohio Farm Bureau Federation. Wade Leaman became manager of the Carroll County Landmark in 1965 and was there until 1970 when he became manager of the former Geauga Landmark, now part of the Western Reserve Farm Cooperative, where he served until his retirement in 1995. After his retirement, he volunteered for three assignments for the Volunteers for Overseas Cooperative Activities in Slovakia, Ukraine and Bulgaria. 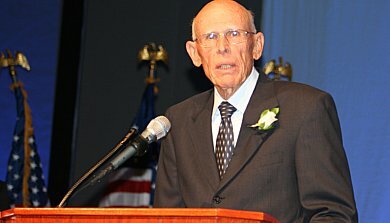 Leaman grew up on a dairy farm and graduated from Penn State University in 1959, majoring in animal science, and also served in the U.S. Army. Ruth McLaughlin is the first Farm Bureau volunteer-member to receive the Agricultural Communicator Award. She writes a weekly article for the Zanesville Times Recorder in which she shares news of Farm Bureau, agriculture and stories from her farm. She is very involved in her community, serving as Sunday school class treasurer and Sunday school teacher at her church, and serving as a leader for junior high youth groups and as a camp counselor. She served as a 4-H adviser for several years, and this past year received the lifetime of service award from Muskingum County Farm Bureau. She often represents the county Farm Bureau at local and state meetings, and has been a member of a local Farm Bureau Advisory Council for more than 50 years. The work of county Farm Bureau volunteers was also recognized during the annual meeting. Hancock County Farm Bureau and Perry County Farm Bureau received the President’s Award, which signifies outstanding accomplishment across all program areas. Honorable mention recognition went to Jefferson and Tuscarawas counties. Excellence Awards for Communications went to Carroll, Champaign, Crawford, Harrison, Hocking, Perry, Shelby, Stark, Tuscarawas, Union, Wayne and Wood counties. Food and Animal Issues Excellence Awards were presented to Ashland, Carroll, Delaware, Fairfield, Hancock, Harrison, Jefferson, Medina, Pickaway, Tuscarawas, Wyandot and Van Wert counties. Receiving Excellence Awards for Organizational work were Auglaize, Champaign, Cuyahoga, Geauga, Jefferson, Marion, Morrow, Perry, Putnam, Richland, Shelby and Van Wert counties. Public Policy Excellence Awards went to Allen, Ashland, Delaware, Harrison, Jefferson, Medina, Morrow, Putnam, Richland, Shelby, Tuscarawas and Van Wert counties. In addition to the programming- based awards, four counties — Carroll, Darke, Monroe and Wayne –were recognized for new or unique activities. PHOTO ABOVE: Discussion meet winner Nichole Gordon-Coy, of Carrollton, and competition sponsor representative, Kurt Ely of Nationwide Insurance. 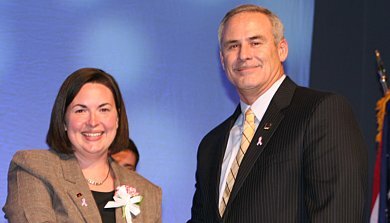 Nichole Gordon-Coy, of Carrollton, won the Ohio Farm Bureau’s 2010 Discussion Meet, held Dec. 1 during the farm group’s annual meeting in Columbus. A member of the Carroll County Farm Bureau, she is a science teacher at Sandy Valley High School in Magnolia, where she teaches physics, chemistry and AP biology. She and her husband, James, and their three children live on livestock farm. During the finals, Gordon-Coy and three other finalists discussed the role of technology in agriculture and the views of consumers toward the food production industry. The other finalists were Shelby Brammell of Kenton, Andrew Spiker of Adamsville and Tim Street of Richwood. Gordon-Coy will compete at the American Farm Bureau Federation annual meeting in Atlanta in January. 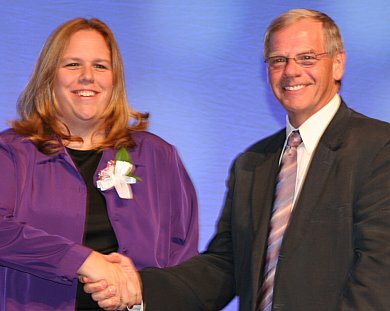 PHOTO ABOVE: Mahoning County Farm Bureau member Jenifer Weaver won the Excellence in Agriculture award, and is congratulated by contest sponsor Tom Schlenker, executive vice president of Farm Credit Services. Jenifer Weaver, of North Jackson, was recognized Dec. 2 during the Ohio Farm Bureau annual meeting as the winner of the Excellence in Agriculture Award, presented to a young professional in the field of agriculture. The award was announced earlier this fall. Weaver, a grain merchandiser and grain department manager at Deerfield Farms Service, will represent Ohio in the national competition during the American Farm Bureau Federation annual meeting in Atlanta in January. Many thanks to these wonderful men and woman for their service!